What is space? It isn’t a question that most of us normally stop to ask. Space is the venue of physics; it’s where things exist, where they move and take shape. Yet over the past few decades, physicists have discovered a phenomenon that operates outside the confines of space and time. The phenomenon—the ability of one particle to affect another instantly across the vastness of space—appears to be almost magical. Einstein grappled with this oddity and couldn’t quite resolve it, describing it as “spooky action at a distance.” But this strange occurrence has direct connections to black holes, particle collisions, and even the workings of gravity. If space isn’t what we thought it was, then what is it? 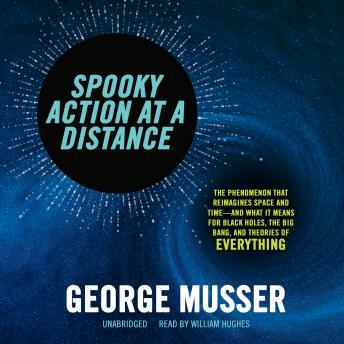 In Spooky Action at a Distance, George Musser sets out to answer that question, offering a provocative exploration of nonlocality and a celebration of the scientists who are trying to understand it. Musser guides us on an epic journey of scientific discovery into the lives of experimental physicists observing particles acting in tandem, astronomers discovering galaxies that look statistically identical, and cosmologists hoping to unravel the paradoxes surrounding the big bang. Their conclusions challenge our understanding not only of space and time but of the origins of the universe—and their insights are spurring profound technological innovation and suggesting a new grand unified theory of physics.